Over the centuries, the “Madeira Wine” won worldwide reputation, through the island and the wine to be synonymous with quality. It is a unique wine, intense, sweet and fresh, and that clears over the years. There are lots of more than one hundred years, still in excellent condition. The vintages are special crops intended specifically to aging. Madeira wine arrived on the world scene in the seventeenth century and became the favorite wine of the American colonies. George Washington drank a pint a night and a glass of Madeira wine sealed the signing of the American Independence Declaration. In Russia was the favorite wine of the court of the czars. It was a glass of this drink appreciated that, in 1917, Prince Felix Yusopov laid the poison intended for Rasputin monk. Among the eighteenth century and the early twentieth century, the works of French authors with the Marque de Sade, Honoré Balzac and Alexandre Dumas, the “Madeira Wine” had multiple laudatory references. Special features of this wine have to do with an accident in the eighteenth century principles. A cargo stored in the hold of a ship, ended up traveling around the world, going twice Ecuador before returning to Madeira. Stirred up by the waves and subject to tropical temperatures has a new and delicious flavor through this artificial aging. By winning in this way, special features of flavoring, became known as the Wine Wheel. The current manufacturing process inspired by this adventure. But while the wine continues to be subject to the same intense heat, no longer have to travel far to achieve its characteristic taste. There are greenhouses to recreate the tropical heat. For cheaper wines, aging is accelerated in furnaces, while high-end of the heating is done smoothly since the pipes in the warehouse. Also dates back to the eighteenth century the fortification process with brandy that catching the fermentation makes the sweet wine. The apogee of export of Madeira wine took place in the late eighteenth century. At that time, two thirds of exports were destined for the US market. From 1831 to England and Russia came to replace the former colonies of the New World. On the nineteenth century Madeira wine almost disappeared due to the double tragedy of powdery mildew (Oidium Tucker – popularly known as the blight of wine) in 1852 and phylloxera (Phylloxera vastatrix) in 1872. These pests have devastated the vines and ruined the production: 55 of the 70 British firms that existed here, closed and left Madeira. To escape the misery, the hand labor emigrated, mainly to Brazil. As in the rest of Europe, the strains of the ancient varieties were replaced by hybrid varieties grafted American vine, resistant to pests. During World War I German submarine attacks on merchant shipping made decreasing exports. However, once in 1919 exports rebounded. The “stocks” of the best wines exhausted and the price in the market has increased and with it the popularity among consumers. World War II brought new difficulties, because rare were the ships stopped off at the port of Funchal. Unfortunately with the peace did not come to much desired recovery. After less happy decades, during which the Madeira wine was almost only used in the kitchen, the prospects have improved. Producers are betting on new markets, such as Japan, which is traditional at weddings toast with a glass of “Madeira”. There has been an effort to recover the traditional varieties and institute more stringent quality controls. Similarly, there has been a search for new mixes and new flavors. The culture of the vine extends over much of the island, with about 14,000 parcels in operation. Most of the old vines takes secular gravelly terraces. It is an exploration into small units, with the strains supported by trellises of wood or cane. About half of the grape production is intended for fine wine with the remainder to produce table wine. Although the grapes are harvested from mid-August to early November, September is the month of harvest and the fields are filled with people soaking up the grapes. The celebration of the grape harvest is an ancient tradition, celebrating is in Camara de Lobos and Santana. The production of the wine producers is sold as a whole, so that in the cellars if I can better control the process of winemaking. Since joining the European Union, EU funds have allowed a technological improvement. No longer are the rubber tappers to transport the wine to the warehouses: now the whole grapes arrive at the winery, where they are weighed, de-stemmed, crushed, pressed and then put to ferment. The wine obtained from the Tinta Negra Mole grape goes first to the stove and then passes into the oak casks. Already in vintage wines this stuffing is not allowed, taking these to mature naturally in barrels for twenty years in satin wood pipos Brazil. Winemakers will monitoring and controlling the whole process. 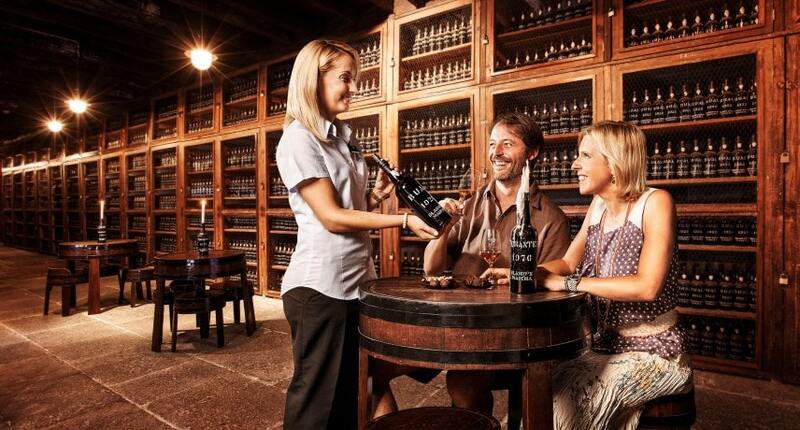 Madeira wine is characterized by its taste the caramelized sugar, aging resulting in wooden cask. The best tasting glasses are tulip shape and average size in order to make better perceive the fragrance. The four major types of Madeira wine are designated by the name of its varieties: Malvasia, Boal, Verdelho and Sercial. Different forms of winemaking produce exceptional wines: Rainwater Madeira, Vintage Madeira and Soleras.